Time, day, and date are all incredibly useful concepts to know in any language, but they don't really lend themselves to conversation the way other topics do. So how do we make these topics accessible and engaging for students? Below I have compiled a list of some of the ways I present and review time, day and date. Feel free to add your own in the comments! Virtual Clock - I love this virtual clock. It shows the current time, or you can adjust it to any time you want. It's great to show on the SMART Board and have kids come up and manipulate when introducing time. Fun Games - The Australian State of Victoria has created some fun games on a variety of topics. If I have a few minutes at the end of class, I'll throw one of these up on the SMART Board and have the kids take turns playing. I then post them on my Edmodo page and encourage kids to play at home. Another fun game is Quizlet's scatter. It's fun to do with time and date (match the written form to the numbers). Horloges App - Stephanie Bass of Bonne idée! shared the wonderful idea to use the native clock app on the iPad to reinforce time (click here to read her presentation on using smart phones and iPads in the FSL classroom). I took this idea and had my students complete a Socrative quiz about time in different francophone cities. First, they switched the language and the keyboard to French to make it more authentic, then they opened up the Socrative quiz (I blogged about Socrative here, by the way). As questions popped up about various cities, they added those cities to the app. Then, they could swipe from the right, and the clocks appear at the side of the screen. The questions asked things like "Il est huit heures à New York. Quelle heure est-il à Paris ?" Since the question and answers were written as words, and the clock app provided numbers, they needed to know how to say the numbers in French. In addition to reinforcing the vocabulary for time, it also reinforced the idea of time zones and geographic awareness. 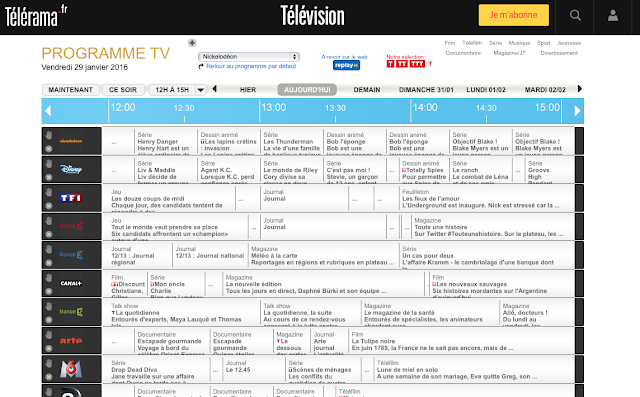 Télérama - Télérama is a French television guide that has program listings on its website. I put this up on the board and ask students when different shows are on. 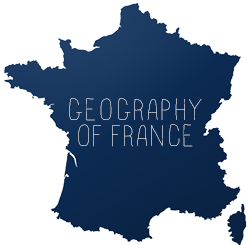 They enjoy seeing what their favorite shows are called in France. I like to use this to reinforce the "à" in "at what time." 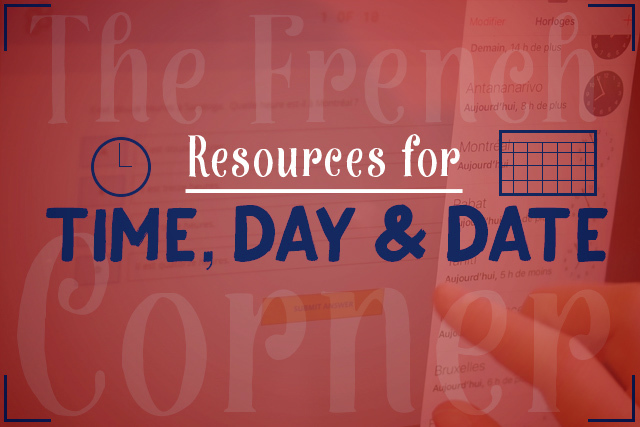 Emploi du Temps - I show my students French school schedules and ask them questions about them. I use these on homework assignments and quizzes. I also have my students make up their own schedule similar to a French one. They enjoy learning about Wednesday afternoons being free! Ecole Poudlard - Students enjoy seeing what schedules from Hogwarts look like in French. This site and others have schedules from all 7 years. I go through the names of the courses with the students, then I have them play a game. Everyone gets a sheet of paper. On one side is a blank schedule. On the other side are the schedules for the first three years. Students get a sticker on their forehead with the number 1-3 (for first through third year). Then, they go around the room asking when they have their various classes. As they tell each other, they fill in the schedule. At the end, they compare the schedules and figure out which year they are in. What Day Is It? - It's hard to review the days of the week. We say the day everyday in class, but even still, it needs reinforcement. One activity I do is describe various holidays and events (such as Thanksgiving, the Super Bowl, etc.) and have students say what day of the week it is. Celebrity Birthdays - For homework, I give students a calendar for a month and put some celebrity birthdays on it. Students have to write the day of the week and the date for each celebrity's birthday, as well as how old they are. More Fun Games - Just as with the time, there are more great games on the Languages Online site for practicing the date. Télérama - When introducing the date, I go back to the Télérama site and show students the links for the days later that week (for example "jeudi 12/1," "vendredi 13/1"), and have them figure out that the numbers are actually the dates. From here they realize that the date is stated opposite (day, month) to how it is in the United States. Birthday Line Up - This is an old classic that you may have heard of before. I have the students (sometimes in two separate groups) line themselves up by birthday speaking only French. These activities work for time or date, as well as numbers in general. Number/Word Match Up - Students get a slip of card stock with a date or time in word form or in number form. They must find their partner with the corresponding date or time. For dates, I include dates with inversed numbers such as "le premier juin" and "le six janvier" to encourage students to think about the order of the numbers in French. 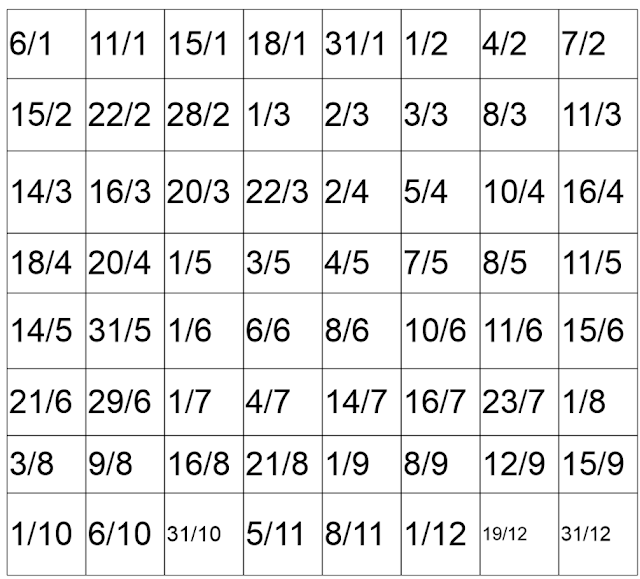 LOTO - LOTO, or French bingo, is easy to play with dates and times. To make the game move along faster, I have students make their own board, but they only pick from a set of dates or times I have up on the board. Whiteboards - Whiteboards are a fun way to practice dates and times. Students have so much more fun when they get to write on a whiteboard! Puzzles - For review day, I give students puzzles made up of squares. On each edge of each square (except the outside pieces), there is a date or time in number or word form. On the edge that touches it, is the same date or time in the opposite form (number or word). 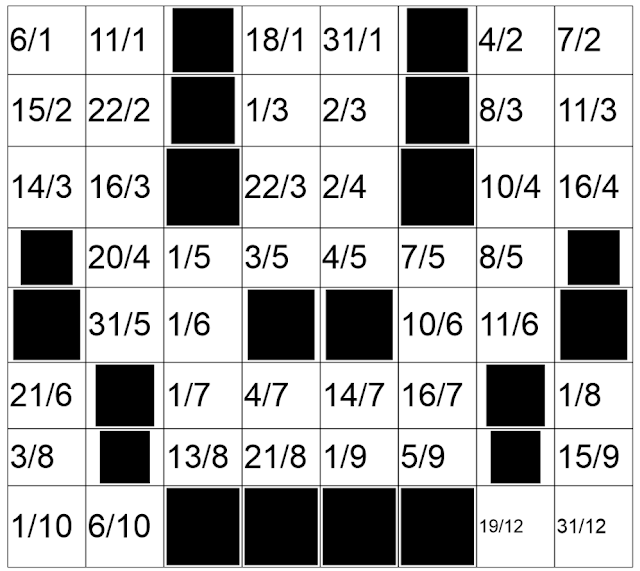 I don't have a file of the date and time puzzle, but below is a photo of a similar puzzle in progress that reviews numbers and other vocabulary. When it it is done, it forms a 4x4 square. Picture Grid - I got the idea to do a picture grid from the blog Confesiones y Realidades. On the blog, Anne talks about grids with the numbers 1-100. The teacher calls out a number, and the students color it in. When the teacher is done, it forms a picture (that the teacher has pre-planned). I did this activity to reinforce numbers, and then I did it again with dates. It could also be done with times. Update 2/8/16 - A commenter asked for an example of the picture grid. Below is a "before" grid, and underneath it what it would look like after I called out the dates. 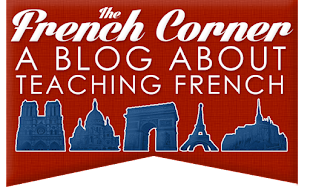 Virtual Trip - Back in 2014, I blogged about the virtual trip to Paris activity I do with my students. They visit a series of websites and plan an imaginary trip, noting down times, days, dates and prices. This year the students completed the activity using iPads, and used QR codes to access the websites. Great ideas, Samantha, thanks for sharing! Just curious, how did you do the picture grid activity with dates? Do you have a photo you could share? Merci!